Consumer-directed health plans may not become as ubiquitous as once thought, survey results suggest. Consumer-directed health plans (CDHPs), which allow participants to tailor their amount of coverage to their expected consumption of health-care services, have become a key strategy for managing both employee and employer costs. But it appears that the CDHP “revolution,” if you will, might not materialize to the extent some observers predicted a few years ago. It was thought that employers in droves might drop their traditional health plans and go exclusively to CDHPs, which in the case of most participants provide lower premiums in exchange for higher out-of-pocket costs for the health care they do consume. That’s not happening. 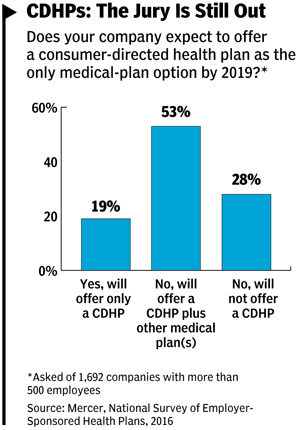 In a Mercer survey of 1,692 employers with more than 500 workers, just 19% said they will offer only a CDHP by 2019 (see chart, below). Growth in CDHPs continued in 2016, but at a slower pace than in recent years. Among the large employers, 61% offered them — a small incremental gain from 59% in 2015, following a big increase from 48% a year earlier. The prevalence actually dipped last year among the 852 participating employers with 500 or fewer workers, to 25%, from 28% in 2015. On the other hand, among the nation’s largest organizations the plans are becoming almost universal, with 80% of those with at least 20,000 employees offering a CDHP in 2016, up from 73% the previous year. At companies that offered CDHPs — which typically consist of a high-deductible health plan (HDHP) combined with either a health savings account (HSA) or flexible spending account — the percentage of employees enrolled in them continued a slow but steady increase last year, reaching 29%. The figure had risen from 13% in 2011 to 25% in 2015. Propelling that trend, the average monthly paycheck deduction for employee-only coverage in an HSA-eligible plan was $84, compared to $132 for a PPO plan. “To the extent that many working Americans may have been overinsured, HDHPs have reduced wasted premium dollars,” Mercer says in its 2016 National Survey of Employer-Sponsored Health Plans. The plans have also educated employees about the actual cost of health care and introduced greater cost transparency, according to Mercer. Further, there is evidence that, because of the high deductibles, the plans have helped to shift consumption of health care from high-cost venues to low-cost ones and reduce unnecessary care. Yet Mercer notes that ultimately, there is a limit to what consumerism can accomplish. “First, it’s been estimated that only about 30% of health-care spending is ‘shoppable,’ meaning that while employees can compare prices for an office visit or MRI, for example, they can’t do so in emergency situations,” the report says. Also, in a high-claim situation, once the out-of-pocket limit is reached, there’s no longer a financial incentive for an employee to seek out less-expensive care. In addition, employers are rightly concerned about the point at which health-care expense causes employees to skimp on necessary care, according to the report. “After all, the reason for offering health benefits is to safeguard employee health and well-being,” it notes. 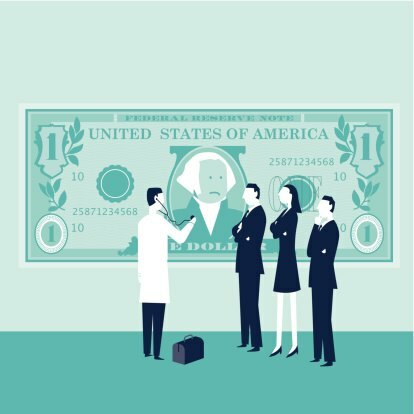 Finally, while moving employees out of higher-cost plans to lower-cost plans does provide immediate savings, offering an HDHP comes with no guarantee that the cost trend will remain low going forward, Mercer notes.